Once they had a list of equipment, the team came down to White Light’s state-of-the-art Studio15 where the White Light team had created a truss rigged at the same height of The Deck which allowed them to evaluate what worked best on its own and together with other fixtures. Paul explains: “After the demonstration, we decided on a mixture of Martin MAC Aura XBs, Clay Paky Axcor Spot 300s, Ayrton MAGICDOT-SXs and Ayrton COSMOPIX-Rs. These all serve different purposes from colour washes to podium lighting and table highlights, depending on the event configuration. The main houselight fixture of the space is the Chroma Q Inspire which provides an even wash over the whole space from warm to cold whites, pastel shades and saturated colours. On the exterior of the building, we opted for the new Martin Quad Graze fitting to highlight the glass sides of the building in a stunning array of colour”. 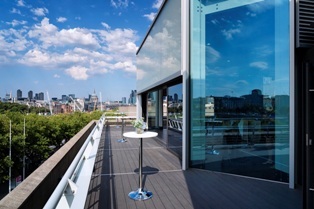 The technology supplied by White Light will be used to elevate the existing space as well as have the ability to quickly change the look of The Deck with light levels and colour to suit any client’s needs. 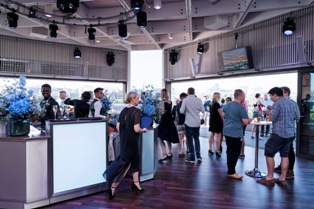 The high-tech system is controlled via a Paradigm touchscreen which is operated by the Hospitality and Events Team, allowing them to trigger pre-programmed states or take control of any fixture and change the live colour to suit the event. 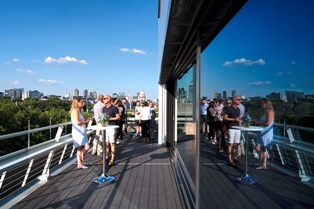 The Deck has now officially re-opened and has already facilitated a range of events. Paul concludes: “Ensuring the space was equipped with the correct lighting equipment was very much a collaborative affair; with myself, Dan, Huw, Clara, Chris from the National Theatre along with Tom McGuire from ETC. We were also very grateful to White Light, in particular Jonathan Haynes and Ally DeCourcy, for their support and guidance throughout”.